The Indians beat Texas today, 5-1, to win 3-of-4 from the Rangers and make the best of a homestand that started off being swept by the Twins. 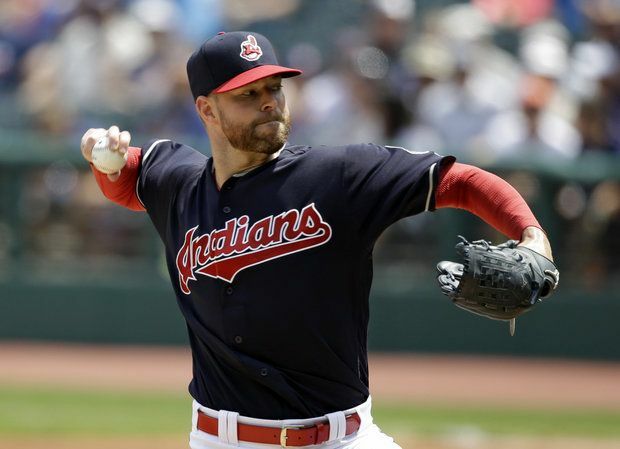 Corey Kluber continues his post DL tear. All I know is that when I see Kluber's two fingers on the ball like this, even I get frightened of being embarassed on national television, like so many hitters. Everyone predicted a rubber match between the Golden State Warriors and Cleveland Cavaliers since, well, basically 5 minutes after Kyrie Irving drove a dagger into Warriors fans' hearts in Game 7. Or at least since the best team in the league, the one that one an NBA-record 73 games, who had the unanimous MVP, added the second best player in the world to its roster. Sam Amick, USA Today: Warriors in 6. "Curry, Green and Kevin Durant are playing at their peak, while Klay Thompson is the slumping shooter who's surely about to blow his top any minute now. The greatness of LeBron James, the continued ascension of Kyrie Irving and the better-than-ever comfort level of Kevin Love will be enough to help the Cavs put up a good fight, but this Warriors group is just too good to be beat." SI's Lee Jenkins: Warriors in 5. "[Durant] doesn’t need to be sensational. Neither does Steph Curry nor Klay Thompson nor Draymond Green. If they simply play well, Golden State wins. The dynamic is different for James, just as it was in ’11. He has to be superhuman." Sean Deveney, Sporting News: Warriors in 6. "[The Cavaliers] can’t keep pace with the Warriors, winners of 27 of their last 28 games, in terms of depth. The Cavs and Warriors went seven games last year, and Cleveland returns much the same lineup this time around. Golden State has lost Andrew Bogut and Harrison Barnes, but they brought in Durant, and his playoff performance to date — 25.2 points on 55.6 percent shooting — has been exactly what the Warriors wanted when they signed him last July." SI's Chris Ballard: Warriors sweep in 4. " ...the only way to see the Warriors losing this series is if they self-sabotage, and that appears unlikely...[LeBron will] go down as the best ever and it may not be all that close by the time he’s done. But he cannot overcome this level of talent, cohesion, and depth. Last year, Golden State intentionally chased history in the regular season. This year they’ll make it, becoming the first team to go undefeated in the playoffs. Kevin Pelton, ESPN.com: Cites a couple sources, from RPM, "Golden State would be expected to win in four games about 20 percent of matchups and win the series 88 percent of the time", and from "market-based PredictWise," "an implied probability of 72 percent for the Warriors to win the Finals." SI's Ben Golliver: Warriors in 5. "The Warriors lack the best player in this series, but they possess more overall talent, better two-way balance, more useful depth, greater lineup versatility, and more individual match-ups to exploit. That, plus home-court advantage and a renewed focus following last year’s catastrophe, should be enough to complete the redemption mission. " SI's Matt Dollinger: Cavaliers in 6. [editor's note: WAIT A MINUTE WHAT IS THIS DOING HERE?] " The Cavaliers have the mental edge. This shouldn't be underestimated. LeBron is in the Warriors' heads. They genuinely fear him after being pushed to the brink of seppuku in last year's Finals. And as for the newcomer who wasn't around last June, why do you think he left Oklahoma City? He's done underestimating LeBron, too." SI's Rob Mahoney: Warriors in 5. "These Warriors aren’t unbeatable, but to beat them four times in seven games would require some dramatic turn of events beyond what we could reasonably expect. These should be competitive games, all in all. I just don’t expect there to be all that many of them, given that Golden State is better prepared to handle just the kind of counters that wore them down over the course of last year’s Finals." SI's Rohan Nadkarni: Warriors in 5. "...there’s no sane reasoning for picking the Cavaliers... The Warriors are the more talented group, and they are playing with a feverish motivation after the embarrassment of last year’s Finals. Frankly, I wouldn’t be shocked if this series was a sweep. But I’ll also happily accept my comeuppance if LeBron makes me eat these words." SI's DeAntae Prince: Warriors in 6. "[The Cavs] don't have enough to overwhelm a motivated Warriors team with a hungry Durant leading the charge. I never feel completely comfortable betting against LeBron, but this is the one team with the talent to overwhelm his Cavaliers. SI's Jeremy Woo: Cavaliers in 7. [editor's note: WHO PUT THIS IN, AGAIN??] "...his is the best edition of the Warriors so far, [but] jumping to sensible conclusions with these teams isn’t always worth the energy. The best version to date of an all-time talented team that hasn’t even lost once in the playoffs should win, right? After all, the only rational basketball argument here is LeBron James, still at the peak of his remarkable powers, with an ascendant sidekick, Jordan’s records in his rearview mirror and all the motivation to repeat he could ever need. And you know what? Somehow… it all sounds kinda reasonable. Screw it—Cavs in seven." Chris Barnewall, CBSSports.com: Warriors in 7. "I was so close to picking Cleveland. So very close. [But the Warriors] had the best offense all season. Their defense has been incredible all season. They've just been more consistent and they added Kevin freakin' Durant. Don't be surprised if Cleveland takes this the distance again, but Golden State just has too much incredible talent on its roster." Tom Ley, Deadspin: "I mean, the Warriors are probably going to win, but I’ve managed to talk myself into believing that the Cavs can win. I will believe this up until Durant drops 40 points in each of the first two games and the Cavs go down 0-2. How about you?" Maurice Moton, Bleacher Report: Cavs in 7. [Editor's note: OKAY THIS IS GETTING RIDICULOUS.] "Many feel Durant tilts the balance in the Warriors' favor for an early knockout, but Love's arrival on the big stage along with the Cavaliers' deep bench rotation evens the playing field." Ethan Skolnick, CBSSports.com: Warriors in 7. "While James will be spectacular, and while we saw he can steal a seventh game at Oracle, that home court edge has to count for something at some point. This time, the fortified Warriors, with lessons learned from their sloppy finish, close stronger." SI's Andrew Sharp: Warriors in 5. "... LeBron is why I'm giving the Cavs a game here. But the Warriors are probably too good to make this any closer. Golden State has a better chance at sweeping this series than the Cavs do at winning it. They are too explosive on offense, and too relentless on defense, and too good at creating fatal mismatches. All of that was true even last year, and that was before the third-best player in basketball joined the second-best player in basketball on the best team in the league. I won't overthink it from there. This seems like it may be a more interesting matchup on paper than it will be on the court. It's great that both teams are healthy and rolling, yes, but when this year's Warriors are rolling, nothing else matters. Not even LeBron. "James Herbert, CBSSports.com: Warriors in 6. "I would have picked the Warriors in five before the playoffs started, but the Cavs' run through the East makes that seem disrespectful." Matt Moore, CBSSports.com: Warriors in 6. "Durant's just too much, he's just really such a great player and when you add him to this team, there's just too much there for the Cavs to handle. The Warriors will overwhelm them with talent, will stay focused, will find enough offensive answers to outlast LeBron James,.."
Jack Maloney, CBSSports.com: Warriors in 5. "Last year's meeting between these two probably would have ended in five games if a certain...um...incident hadn't happened, and now the Warriors have Kevin Durant." Brad Botkin, CBSSports.com: Cavs in 7. "You can call up all the advanced stats you want, but basketball, when you really get down to to it, particularly in playoff situations that often come down to winning a few crucial possessions, tends to be pretty simple: Best player wins. Give me LeBron in another epic series." Michael Singer, USA Today: Warriors in 7. "The Warriors are a devastating group that not only have last year's collapse still lingering in their minds, but also an inherent motivation in Steve Kerr." AJ Neuharth-Keusch, USA Today: Warriors in 6. "This is a Cavaliers team that struggled mightily on the defensive end in the regular season. Sure, they've been significantly better in the playoffs, but their first three opponents couldn't hold a candle to Golden State. Simple as it sounds, the Warriors are just too strong and talented on both ends of the floor to end another campaign without the Larry O'Brien Trophy." ESPN's Basketball Power Index: 93% chance of the Warriors winning the series (at the end of a large statistical breakdown of the players and teams. ESPN's FiveThirtyEight: 90% chance of the Warriors winning the series. ESPN's Fan Panel: 70% chance of the Warriors winning the series.